How long are the gift vouchers valid for? Our vouchers are valid for nine months from the date of purchase. My gift voucher is about to expire, what can I do? I thought a microlight gift voucher was a great idea for a present, but I was wrong! No problem, we offer a 28-day, no quibble refund. We want happy customers, so we won't even charge any processing fees, postage etc. Money laundering regulations mean we must refund to the credit/debit card used for the purchase. I ordered today, how soon will I get the gift voucher? We use 1st Class post to mail our microlight vouchers. If you order by 3:30pm Mon-Fri, the gift voucher is usually in that day's post. On Saturdays, if you order by 11am, we can catch the 12 noon post. If you are in a hurry, just call 0797 997 1301 and we can email something out too. What does the gift voucher pack look like? We have an information booklet, pictured above, with the voucher on the back page. We pop that in a coloured envelope and then post it out in a slightly larger than usual white envelope, hand addressed with a large First Class stamp on it. There's nothing to say who it is from, nothing to give away the surprise! Whose name is the voucher made out to? 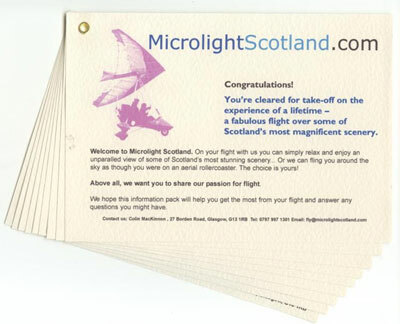 Our microlight gift vouchers are numbered. We don't put a name on them. So they are fully-transferable. Who are Be Pampered, whose name appears on my bank statement? Be Pampered is the business that processes the gift voiuchers for us. They check the payments, produce the vouchers and post them. They also pay the instructors once they have flown. Why Be Pampered? Well, it was a name used by Marta for a previous business and it hides the fact that you have bought a Microlight Gift Voucher from anyone else who might see your card or bank statement - a common problem with internet banking! What's the youngest you can go microlighting? The youngest we fly is a responsible 12-year-old. You can log the time towards your NPPL if you are at least 14 years old, fly solo at 16 and get your full licence at 17. We have no upper age limit. In 2015 the oldest person in the UK to get a NPPL (Microlight) was 94! For a gift voucher flight we suggest being "fit to drive" and happy to be sitting with your legs wrapped round the instructor - like riding pillion on a motorbike. Yes. Students must weight less than 110kgs (17 stone 3lbs). If you weigh over 100kgs, please let us know at the time of booking so we can adjust the amount of fuel we upload. A microlight is an aeroplane allowed to carry no more than two people and must weigh 450kg or less (including fuel and passengers). How safe is a Microlight? Microlights are not only the largest group of light aviation aircraft in the UK but they also have one of the best safety records. Despite their fragile appearance, modern microlights are incredibly strong. Even in the highly unlightly event of an engine failure the aircraft will simply glide safely to earth. Who will fly the aircraft during my experience flight? Your pilot on the day will be a fully qualified flying instructor (UK Civil Aviation Authority approved) with ample experience. You will be in extremely safe hands. How fast will the microlight fly? You will fly around 60mph. How high will the microlight fly? Typically we will fly about 2-3,000ft above sea level..
What are the weather limitations for microlight flying? Microlights are best flown in light winds, up to 15 knots, with good visibility. What should I bring on the day of my experience flight? Bring warm clothes, particularly suitable windproof outdoor footwear. We will provide a cosy flying suit, electric heated gloves, helmet and radio headset and a balaclava if required. If you bring a camera so you can take away a souvenir of your flight, make sure it has a way of attaching a safety strap - many mobiles phones don't!